Luckily, there are many small changes you can make to look after our planet. Start with your venue location. Think about where the majority of attendees will be travelling from and try to hold your event close to them. The farther people have to travel to get to the event, the bigger the impact your event will have on the environment. If some distance is inevitable, at least try to choose a venue that is relatively close to the airport to reduce additional driving. If you can secure one that’s also close to a hotel precinct, that’s even better! Expert level: pick a venue location that’s well serviced by public transport to reduce your attendee’s carbon footprint. When hosting an event or conference, you’ll likely have people travelling from all over the country. Whether they’re flying in, driving down or living local, try to encourage your guests to take public transportation to and from the venue. Not only will this reduce the carbon foot print of your event, but it will also help avoid traffic jams and overfilled carparks. Why print your agendas, marketing collateral and other event forms when it’s so much easier to do it all digitally? So much paper is wasted on handouts that get promptly thrown in the bin. Consider creating an app that has all the information for your event, including maps, timetables and speaker details. Choose a website over flyers and use QR codes to reduce handouts for promotional offers. 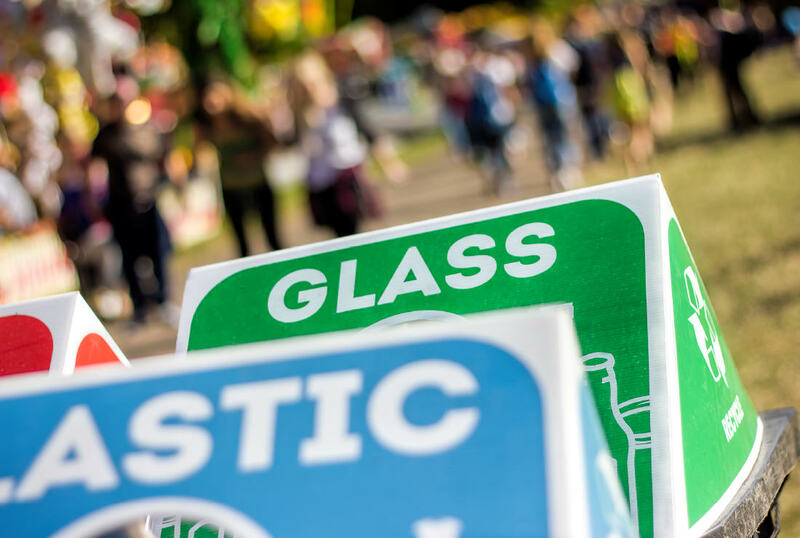 Handing out plastic water bottles and plastic-wrapped food is pretty standard at an event or conference; however, it also causes loads of unnecessary waste. Where you can, try to offer food and water stations that don’t require individual packaging. Not only will it save on waste, but it looks and feels much more sophisticated too. The good news is that many hotels now offer “green” marketing packages as an option, providing a water station instead of individual plastic bottles, for example. It’s also a great idea to have dual bins situated around the venue to help your guests separate their trash and recyclables. Keeping your venue at a comfortable temperature is key. No one wants to suffer in a hot and stuffy room! But the more you cool your venue, the more energy required, generating harmful greenhouse gases. This is especially true when used in large-scale venues like those required for a national conference or roadshow. Strike a balance between energy efficiency and comfortability and aim to keep the temperature at a reasonable 24 degrees Celsius. You don’t have to make every eco-friendly decision yourself. There’s so much to consider, it’s easy to get overwhelmed, on top of all that organising an event entails. But you don’t have to go it alone. Seek out like-minded suppliers who also value sustainability. This will take some of the weight off your shoulders and give you peace of mind that you’re all on the same page. Take your green event to the next level with carbon offsetting! A great way to balance out the emissions produced by your event is to invest in an environmental project. Use a carbon footprint calculator to estimate the amount of carbon likely to be generated by your event and make an equal donation or contribution to your preferred green initiative. Depending on the size of your company, you could even consider implementing clean energy technologies or renewable energy within your business operation. When it comes to emission reduction and sustainability, there will always be room for improvement. What’s important is to be aware and take steps to reduce your impact. If you need a hand organising a green event you can be proud of, we can help! Chat with our team and let’s get planning.